Sporozoite Strong GFP-Luciferase expression in sporozoites. The mutant expresses GFP-LucIAV under the control of the promoter of the circumsporozoite (CS) protein gene of P. berghei. This mutant has not been characterized yet in detail, both with respect to (wildtype) growth characteristics and (strength) of the expression of GFP-Luciferase in oocysts, sporozoites and (young) liver stages. 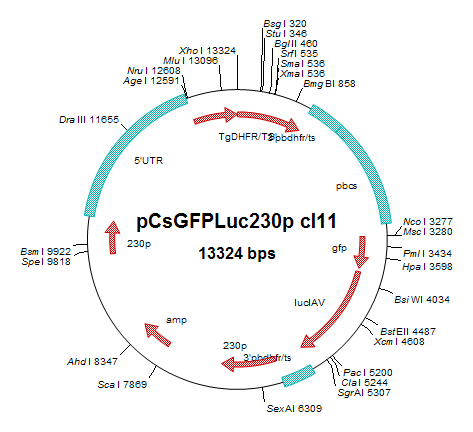 The transgene has been introduced in the non-essential 230p locus of P. berghei. Introduction of other (trans)genes into this locus has shown that disruption of 230p locus has no effect on the growth characteristics of the parasites. Additional remarks genetic modification The GFP-Luciferase gene (1 copy) has been inserted into the 230p locus (PB000214.00.0) by double cross-over integration.